The Eponymous Flower: 15 Cloisters Dissolved: What Remains of the Order of the Franciscans of the Immaculate? 15 Cloisters Dissolved: What Remains of the Order of the Franciscans of the Immaculate? What Remains of the Franciscans of the Immaculate? 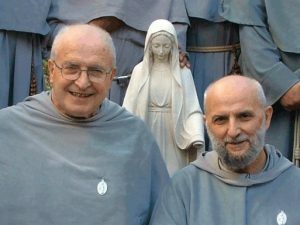 (Rome) How far has the destruction of the Order of the Franciscan Friars of the Immaculate progressed? This is the updating of a chapter that is like a dark shadow on the pontificate of Pope Francis. The Order represented an anomaly of Catholic orders until July 2013. While the old religious orders steeped in tradition suffer decline and waste away, the young Franciscan Order saw a veritable blooming of vocations. Its peculiarity was that the founders did not turn to liberal openings after the Council, but returned to the rigor of the Franciscan ideal. The sensibility which unfolded there led to a return to the traditional rite under Pope Benedict XVI. 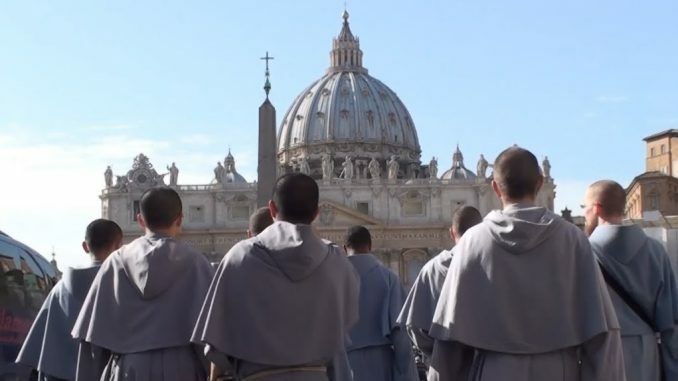 The Franciscan Friars of the Immaculate were thus the only new rite order, which moved to the traditional form of the Roman Rite and the rigor of its life, attracted many young people, while other orders starved. The particularity which defined this Order as community of the old rite, is that it did not belong to the Pontifical Commission Ecclesia Dei, but the Roman Congregation for Religious, which is otherwise only concerned with the new rite. Another peculiarity distinguished the young, blossoming order from the Ecclesia Dei- communities. Besides the charism of the order, the Franciscan ideal of Marian devotion, love for tradition and the traditional rite, there was a missionary zeal. While the Ecclesia Dei communities are enclosed in garden preserves, where in some dioceses they are tolerated more than accepted, the Franciscans of the Immaculate had the freedom of new rite communities to openly develop their apostolates freely and to be especially active in mission. With its turn to the old rite, the first difficulties began with the diocesan bishops. Of the three known friaries established in German-speaking countries, only Kitzbühel (Archdiocese of Salzburg) established in 2002, was successful. The two other, more recent attempts (diocese of Bolzano-Brixen, and Linz Diocese) were rejected. The young religious order enjoyed papal benevolence under Benedict XVI., which suddenly changed under Francis. In July 2013, just four months after his election, the Religious Congregation completely overturned the order's leadership with papal approval. The Order was placed under provisional administration. The Commissar, Capuchin Father, Fidenzio Volpi, who was no friend of the traditional rite, began a veritable destruction. Father Volpi, who died in June 2015, was replaced by the Salesian and canon lawyer, Sabino Ardito. The destruction of the Order has continued nevertheless, unabated. Reasons for radical intervention in the blossoming religious were still not known. Behind closed doors the Commissioner and the head of the religious congregation confirmed that which observers had suspected from the start: The reason was the aforementioned feature of the Order. A new rite order, which had moved to the traditional rite, attracted numerous vocations of young people and aroused growing attention from other new rite orders, which began to be interested in this "success story", could not be. The decree by which the provisional government was established, only contained a detailed determination. But it revealed the thrust of the action: Despite anything to the contrary that had been issued by Benedict XVI. with the Motu Proprio Summorum Pontificum, it was determined that no priest of the Franciscan Friars of the Immaculate be allowed to celebrate the traditional rite any longer. Anyone who wished to celebrate the old rite had to make a private application, which had to be approved by the Commissioner. More contempt for the traditional rite could not be demonstrated. Under Pope Benedict XVI. it had not been possible for hostile forces to take action against the order. With the election of Pope Francis, who commented disparagingly in June 2013 about traditional circles, the situation had changed in one fell swoop. Because of his power, Pope Francis prevented that the leadership of the order could turn to the Apostolic Signatura against the actions of the Congregation of Religious. The order had no legal recourse. It had to endure. Since the beginning of the act of dismemberment, 14 monasteries were dissolved by the commissioners. Currently, even the dissolution of the monastery of Florence is being prepared, which was a center of the order before the provisional administration. It will be the 15th Monastery closure since the beginning of the provisional administration. The commissioners have proven to be employed against the order not as benevolent fathers, as Cardinal De Paolis was, whom Benedict XVI. placed at the top of the Legion of Christ in 2010 when the order had fallen into a spiral by uncovering of the double life of its founder. The commissioners of the Franciscans of the Immaculate were employed, rather more like liquidators. Three and a half years after his establishment at the Legion of Christ, Cardinal De Paolis ended his administration with the election new leadership for the order. There is no end of the apostolic administration for Franciscans of the Immaculate. The poignant question now arises, what will then be left of the former order? With the death of the first Commissioner, at least, the influence of Father Alfonso Bruno seems to have declined. Alfonso Bruno was the Media Representative of the order's earlier leadership. He is considered the real brains behind the rebellion against the founders and the charism of the order. Officially, he does not seem to be among the five brothers, who had turned to the Congregation of Religious with a letter to complain against the exclusive use of the traditional rite in the order. In the concern for pastoral care, the order had actually remained biritual. Yet the letter was the incentive to intervene by the Congregation of Religious. Commissioner Volpi appointed Alfonso Bruno Secretary General and was influenced by him. Otherwise, the Commissioner had mad false claims against Founder Stefano Maria Manelli, for he was convicted of defamation in a state court judgment. The execution of punishment was kept from him only by his unexpected death. The new Commissioner, Ardito, did not make the same mistake obviously. While Volpi was the sole Commissioner, Father Ardito has employed a Jesuit and Capuchin as assistants besides. He thus has dispensed with a General Secretary and sent Alfonso Bruno in September 2015 to be the head of a religious house in Messina, Sicily. However, he is set to continue his campaign against the former Superior General, Father Manelli, who was deposed in 2013. He is, according to rumors, behind a blog which is called "The Truth about the Provisional Administration of the Franciscan Friars of the Immaculate" and is only overflowing with malicious articles. Meanwhile, the first vows were conducted without the typical consecration to the Immaculate Heart of Mary in Brazil and the Philippines. It was replaced by a simple expression of willingness to go on mission. The consecration to Mary is a fourth vow a characteristic of the order. In addition to the three evangelical counsels of poverty, chastity and obedience, which is common to all religious communities, the Franciscan Friars of the Immaculate make a fourth Marian vow which precedes the others. The abolition of the consecration to Mary is the second concrete imposition upon the charism of the order. "It raises the question: Was this consecration the problem? And if not: Why do you force upon the order such a change of its original charism," wrote Libertà e Persona. The canon lawyer continues to debate whether the Decree of the Congregation of Religious of July 2013 is at all lawful or not. Opinions vary. The same applies to specific interventions such as the abolition of Consecration to Mary. Some canonists think that such an intervention could be resolved legally only by the General Chapter of the order. Again, opinions differ. Since Pope Francis forbade the courts to hear the discussions of the canonists, whatever conclusions they reach, for now, have no actual impact. Since the provisional administration, numerous brothers have wanted to leave the Order. They want to maintain the lifestyle to which they have committed themselves through their vows. The planned start-up of an old rite order was banned by the Congregation of Religious. It's another indication that it is opposed to tradition and the traditional rite. Commissioner Volpi threatened the bishops not to allow Franciscan Friars of the Immaculate, leaving their order. At the same time he presented accused those "entrusted" to him, of wanting to overthrow Pope Francis. The brothers want to remain faithful to their consecration to Mary, the full devotion to the Immaculate. Its abolition represents a serious encroachment on the identity of the order. It is a cause of uncertainty and anger that there is no recognizable connection between the abolition and the introduction of the provisional administration. According to credible sources this intervention is to be extended to the female branch and thus also to the Franciscan Sisters of the Immaculate to place them in a moral dilemma, who have vowed loyalty to a particular charism that has been accepted and confirmed by Pope John Paul II in 1998. The media always finds new horror stories to publish about the Order. Comparable hate campaigns had appeared in the German language are endured by the Opus Dei, the Engelwerk that Auerbacher SSND and also includes The Work. Monastery walls seem to inspire outlandish fantasies not only for journalists. With the cloister in Florence, 15 convents have been closed. The provisional administration is leaving a veritable trail of destruction. 60 brothers have officially asked to be released from their vows to leave the order. Since Rome fears the establishment of a new order, the applications are not being accepted. The majority of them have been blocked for almost three years. As this path has proved a dead end, more brothers have given up an application. With a Rescript ex audientia from April 4, 2016, which was made ​​public only last May 11th, Pope Francis has revoked the previously self-evident right in church history of the right of diocesan bishops to recognize new religious communities. On June 1st received the approval by the Holy See. With the Rescript, Francis noted that the establishment of an order by a diocesan bishop without the consent of Rome is null and void. The centralization ordained by Francis is the exact opposite of the other "decentralization" represented by him for the Church is as it carried out concerning the nullity of marriage, where the diocesan Bishop alone can decide today, or aiming for the admission of remarried divorcees to Communion. Bishops close to Francis confirm, as the progressive magazine Il Regno reports, that although much of collegiality and synodality is talk, that the concentration of power in the hands of the Pope had never been so great in Church history. Libertà e Persona presented the question in this context: "Is a federation of the Congregation for Religious preparing a common formation for all religious orders with their different charisms? Is a leveling of all charisms into a sort of syncretism of religious life what is desired? " the fourth Marian vow of the FFI. and completely abandoned to Me. and he now senses that his defeat is at hand. HH Pope Paul VI famously said, "the smoke of Satan has entered the sanctuary..." That was said fifty years ago. The smoke is now everywhere it would seem, especially now. The Catholic church needs a new wind to clean this out as many are feeling the effects of dire smoke inhalation. The papacy of Francis, like all papacies, are given time limits. Popes come and go. May the next papacy return the barque of Peter to its correct course - let Scripture and Tradition be its guide. Pray for the Church. Christ is still with Her and Mary intercedes for her....though it is hard for them to penetrate the smoke of Satan at times given the hearts and mind-sets of many who lead us. Christ will prevail. Souls are in peril. For patience, clarity, conversion -- let us pray for these. God help us. The Institute has been hit hard. Some very holy friars have managed to leave and more want to. They only want to live the charism that was approved by the Saint Pope John Paul II. It is not outside of the Church or her true holy teachings at all. Which is why the Institute is hated by some. And the Order is under Our Lady and Our Lady is hated by some of the powers that be. The closing of the holy seminary was on a December 8th and then last December 8th along with some stupid sustainability UN thing, pictures of animals where shown on the façade of St. Peter's. Nothing about Our Lady. There is a lessening of Marian books, pilgrimages, and other devotions as well as the promotion of the messages of Our Lady of Fatima. Yes, there was a biritual attitude happening but with full approval of PB16. Those who remain offer their sufferings and even with some peace to hasten the Triumph of the Immaculate. And rumor has it that at least 2 of the 5 instigators are now outside of the Order, perhaps to cause trouble somewhere else. But the Order, while decimated, is not dead yet. In a more favorable time, things will be restored. What is Francis so afraid of????? God gives a vocation to the religious life and the grace to respond. I would not want to interfere with that process. Popes have been wrong before and I believe this one is going down a very slippery slope in terms of being so obviously anti-tradition. C'est domage!!!! Another "Papal cataclysm", when the Barque of Peter seems to be sinking quickly, but by faith, it will live supreme in God's uprising time. It is near! Stay in Peter's Boat!!! but fight the battle of evil from within. The Franciscans of the Immaculate have a strong canonical case against Pope Francis with his much praising of Vatican ll. Francis has violated the Second Vatican Council. The Council states, "Religious orders are to reform and RETURN to the spirit of their founders". The Franciscans of the Immaculate obeyed V2 in returning to the spirit of their founders. The Modernists wonder why traditionalists question Vatican ll. The Documents say one thing and the Modernists do the opposite and then have the audacity to order traditionalists to obey Vatican ll. Pack of Hippocrates! HolyLove.Org … thank God for the sacrificial lambs, our TRUE religious. If the brothers and sisters of the FFI are neither being allowed to stay in their monasteries, nor to leave their order, there may be an alternative that would allow them to live their actual charism, but outside the control of the hierarchy: the Beguines and Beghards. These are private individuals living together without vows. Well, they've already taken them, so they are just living them out. It might be a way of getting around the situation for now. What an irony that this pope chose as his designation "Francis." Nonetheless, even that cannot conceal the arrogant, narcissistic, authoritarian, ignorance and lack of respect that this pope has for the Christfaithful truly responding to divine graces. They need to leave the conciliar structure and operate under a traditional Bishop. Their order would grow and be a healthy refuge for Roman Catholics dedicated to tradition. And now they want their paws on the SSPX. Pray for the FSSP, Monks of Clear Creek, Institutes of Christ the King, Good Shepard, etc. Hang in there SSPX. Saint Pope John Paul II? The same one that after the attempt on his life, read the Third Secret of Fatima carefully. Then hatched the plan to claim himself as the Bishop dressed in white. Consecrating the world instead of Russia, sending $100 million to Poland's Solidarity Union and calling the world's false religions to Assisi to pray for peace. All in an attempt to ape Our Lady's authentic formula for world peace. Do you mean that John Paul II? are there any traditional bishops left in italy? and that he only wants the sspx under his control so that he can destroy them. ++fellay, don't sign anything, it's a trap. "I applaud the Cardinals for uniting in this decision. Time alone holds the answers for many questions, both in this Mission, the Church and the world. Pray for Francis the First." Yes one of them was consecrated by Bishop Des Lauriers & another was consecrated by Bishop Sanborn. Plus both SSPX groups have chapels in Italy. For anyone who doubts the Thuc line,Clear Creek has an active Thuc line priest who's holy orders were declared valid. I'm sorry to have offended you. I was depending on spell check. The great and saintly Pope St. John Paul II the Great. You will do well to seek his intercession. Once can only be "within" ie in the bosom of the Catholic Church, by rejecting the Vatican 2 sect and all its heresies. One does not stay "in" the Church by adhering to heresies or heretics, no matter what their attire, or title or what buildings they inhabit. The true Church is underground, we have had no pope since 1958. The men who claim to be leaders of the Church are manifest heretics who reject infallible Church teaching. Nothing is more certain and reliable than the faith, not signs or wonders nor anything. Our bishop and priest's are in the same Thuc-Des Lauriers line via Bishop McKenna. We all recognize both SSPX groups as valid & Catholic. He's afraid of showing his pectoral cross around certain religious groups. But yeah, he's pope. I had just discovered the FFI on my journey out of the novus ordo and back to the real, true, licit Mass and Catholic faith which is of course why francis pulled the plug on them, don't want any of those darn, pesky spiritual renewals happening. If you say that we have had no Pope since 1958, then you are calling Our Lord a liar. You cannot be a Catholic and say that we have had no Pope for decades. Sorry. Cardinal Aviv is most likely the culprit who on his own volition decided to forbid the 4th Marian Vow. You know how those effiminate types hate Our Lady. This was the Cardinal´s own decision, I believe. This pope is either an old fool, a bad old man or simply not intelligent and being led by the nose by the father of lies and his cohorts. Exactly! The effeminate and the heretical hate Our Lady and it is showing forth regularly from the Vatican these days. We will not have to wait long now for world events to alter this sad, sad state of affairs. The Blessed Mother will rescue us in just over a year, according to a credible contemporary prophet. This has a precedent in the abolition of the Jesuits a couple hundred years ago. May I humbly ask, what nations are the fifteen FFI facilities that closed located. Is FFI located in USA anywhere? I really enjoy this site. The Wojtyla of Theology's Body. Yes, you DO have to be a Roman Catholic to live a true Franciscan charism because the center of it is the Holy Eucharist! Holy Mary, Mother of God, pray for us sinners now and at the hour of our deaths, amen. I heard both the friaries in Australia are closed now. The Order is crippled but it is not suppressed and it will bloom and grow again in a new age of the Church when modernism is defeated by Our Lady. Yeah, this is WORSE than the dissolution of the Jesuits back some 200yrs. BUT the Pope here is acting according to the pyramidal hierarchy of the Jesuits, based on the MILITARY model of its founder. However, the Order was obedient to the pope and this Pope has nobody over him. We are almost 6 months through the 100yrs anniversary of Fatima. If the persecuted a la Soviet tactics hold out, a BIGGER victory of Our Lady may just solve everything before the end of the year! Much of thanks for laying it all on the floor for everyone to see. Now I understand why the Institute had to endure such atrocities. Much of the Saints endured much more persecution than these. I know by God's Providential Aid the Institute will Triumph together with Mary, Most Holy and Most Holy S. Joseph's intercession and much of them Saints' pleadings,intercessions, etc. May God's will be done. I know the truth will set us all free. Blessed be God forever. God bless us all! May all the Holy Choirs of Angels pray for them and us, as well. Blessed be the Triune God forever! Amen.